For other uses, see Dartmoor (disambiguation). Dartmoor is a moor in southern Devon, England. Protected by National Park status as Dartmoor National Park, it covers 954 km2 (368 sq mi). The granite which forms the uplands dates from the Carboniferous Period of geological history. The moorland is capped with many exposed granite hilltops known as tors, providing habitats for Dartmoor wildlife. The highest point is High Willhays, 621 m (2,037 ft) above sea level. The entire area is rich in antiquities and archaeology. Dartmoor is managed by the Dartmoor National Park Authority, whose 22 members are drawn from Devon County Council, local district councils and Government. Parts of Dartmoor have been used as military firing ranges for over 200 years. The public is granted extensive land access rights on Dartmoor (including restricted access to the firing ranges) and it is a popular tourist destination. Dartmoor includes the largest area of granite in Britain, with about 625 km2 (241 sq mi) at the surface, though most of it is under superficial peat deposits. The granite (or more specifically adamellite) was intruded at depth as a pluton into the surrounding sedimentary rocks during the Carboniferous period, probably about 309 million years ago. It is generally accepted that the present surface is not far below the original top of the pluton; evidence for this includes partly digested shale xenoliths, contamination of the granite and the existence of two patches of altered sedimentary rock on top of the granite. A considerable gravity anomaly is associated with the Dartmoor pluton as with other such plutons. Measurement of the anomaly has helped to determine the likely shape and extent of the rock mass at depth. Dartmoor is known for its tors – hills topped with outcrops of bedrock, which in granite country such as this are usually rounded boulder-like formations. More than 160 of the hills of Dartmoor have the word tor in their name but quite a number do not. However, this does not appear to relate to whether or not there is an outcrop of rock on their summit. The tors are the focus of an annual event known as the Ten Tors Challenge, when around 2400 people aged between 14 and 19 walk for distances of 56, 72 or 88 km (35, 45 or 55 mi) between ten tors on many differing routes. The highest points on Dartmoor are on the northern moor: High Willhays, 621 m (2,037 ft), (grid reference SX580895) and Yes Tor, 619 m (2,031 ft), (grid reference SX581901) The highest points on the southern moor are Ryder's Hill, 515 m (1,690 ft), (grid reference SX660690), Snowdon 495 m (1,624 ft), (grid reference SX668684), and an unnamed point, 493 m (1,617 ft) at (grid reference SX603645), between Langcombe Hill and Shell Top. 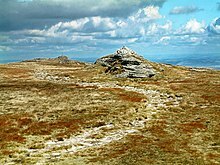 The best-known tor on Dartmoor is Haytor (called Hey Tor by William Crossing), 457 m (1,499 ft), (grid reference SX757771). For a more complete list see List of Dartmoor tors and hills. The high ground of Dartmoor forms the catchment area for many of Devon's rivers. As well as shaping the landscape, these have traditionally provided a source of power for moor industries such as tin mining and quarrying. The moor takes its name from the River Dart, which starts as the East Dart and West Dart and then becomes a single river at Dartmeet. It leaves the moor at Buckfastleigh, flowing through Totnes below where it opens up into a long ria, reaching the sea at Dartmouth. For a full list, expand the Rivers of Dartmoor navigational box at the bottom of this page. Much more rain falls on Dartmoor than in the surrounding lowlands. As much of the national park is covered in thick layers of peat (decaying vegetation), the rain is usually absorbed quickly and distributed slowly, so the moor is rarely dry. In areas where water accumulates, dangerous bogs or mires can result. Some of these, topped with bright green moss, are known to locals as "feather beds" or "quakers", because they can shift (or 'quake') beneath a person's feet. Quakers result from sphagnum moss growing over the water that accumulates in the hollows in the granite. The vegetation of the bogs depends on the type and location. Blanket bog, which forms on the highest land where the rainfall exceeds 2,000 millimetres (79 in) a year, consists mainly of cotton-grass (Eriophorum species), sedges (Carex and Rhynchospora), Bog Asphodel and Common Tormentil, with Sphagnum thriving in the wettest patches. The valley bogs have lush growth of rushes, with sphagnum, cross-leaved heath, sundews and several other species. Some of the bogs on Dartmoor have achieved notoriety. Fox Tor Mires was supposedly the inspiration for Great Grimpen Mire in Conan Doyle's novel The Hound of the Baskervilles, although there is a waymarked footpath across it. Sabine Baring-Gould, in his Book of Dartmoor (1900) related the story of a man who was making his way through Aune Mire at the head of the River Avon when he came upon a top-hat brim down on the surface of the mire. He kicked it, whereupon a voice called out: "What be you a-doin' to my 'at?" The man replied, "Be there now a chap under'n?" "Ees, I reckon," was the reply, "and a hoss under me likewise." Along with the rest of South West England, Dartmoor has a temperate climate which is generally wetter and milder than locations at similar height in the rest of England. At Princetown, near the centre of the moor at a height of 453 metres (1,486 ft), January and February are the coldest months with mean minimum temperatures around 1 °C (34 °F). July and August are the warmest months with mean daily maxima not reaching 18 °C (64 °F). Compared with Teignmouth, which is on the coast about 22 miles (35 km) to the east, the average maximum and minimum temperatures are 3.0 °C (5.4 °F) and 2.6 °C (4.7 °F) lower respectively, and frost is at least five times as frequent. On the highest ground, in the north of the moor, the growing season is less than 175 days – this contrasts with some 300 days along most of the south coast of the county. Rainfall tends to be associated with Atlantic depressions or with convection. In summer, convection caused by solar surface heating sometimes forms shower clouds and a large proportion of rainfall falls from showers and thunderstorms at this time of year. The wettest months are November and December and on the highest parts of the moor the average annual total rainfall is over 2,000 millimetres (79 in). This compares with less than 800 millimetres (31 in) in the lower land to the east around the Exe Estuary, which is in the rain shadow of the moor. Due to the influence of the Gulf Stream snowfall is not common, though due to its high altitude it is more vulnerable to snowfall than surrounding regions. Between 1961 and 1990 Met Office data shows that there was an average of 20 days when snow fell on the moor, and over 40 days a year with hail, which is as high as anywhere else in the country. This results when cold polar maritime air that has travelled over a large expanse of warmer ocean is forced to rise over high country. When average temperatures at Princetown between 1961 and 2000 are compared, the average annual temperature in the decade 1990–2000 was up by 0.2 °C (0.4 °F) and the late winter temperature increased by 0.5 °C (0.9 °F). Because of Dartmoor's height and granite geology, it experiences strong winds and has acidic soils. In consequence it has been subject to very little intensive farming, and all these factors combine to form the basis of the important ecosystems found here. The landscape is one of granite with peat bogs overlying it. While the moors topped with granite tors are the most iconic part of Dartmoor's landscape, only about half of Dartmoor is actually moorland. Equally important for wildlife are the blanket bogs, upland heaths and the oak woodlands which are all of global importance. Dartmoor is a Special Area of Conservation (SAC) with four habitats (Northern Atlantic wet heaths with Erica tetralix; European dry heaths; Blanket bogs and Old sessile oak woods with Ilex and Blechnum in the British Isles) being listed as primary reasons for the selection of Dartmoor as a SAC. In addition the area has a population of the Southern damselfly which is also a primary reason for its selection along with populations of Atlantic salmon and Otter being qualifying reasons. Wistman's Wood is one of the old sessile oak woods which contribute to the listing of Dartmoor as a SAC and is possibly a surviving fragment from the earliest Neolithic woodland clearances. It is home to exceptional epiphytic mosses, liverworts and lichens. Nearly 50 species of moss and liverwort are found in the wood along with 120 types of lichen, including Smith's horsehair lichen, speckled sea-storm lichen and pendulous wing-moss. Over 60 species of lichens grow on the exposed surfaces of the granite tors, including granite-speck rim-lichen, purple rock lichen, brown cobblestone lichen and goldspot lichen and many rare lichen grow on rocks exposed by mining which are rich in heavy metals. On the upland heaths heather (ling) and bell heather are common along with western gorse. In dry grassy areas tormentil, heath bedstraw and heath milkwort are all common. Cross-leaved heath and purple moor grass grow in wetter spots and in the boggy areas many different species of sphagnum and other mosses can be found along with liverworts, Hare's-tail Cotton-grass, round-leaved sundew and bog asphodel and in the valley bottoms, many different sedges, bogbean and pale butterwort all grow. A large variety of bird species can be found on Dartmoor including ones that have declined elsewhere in the UK, such as skylark and snipe, or are even rare nationally, such as the ring ouzel and the cuckoo. There are internationally important populations of meadow pipit and stonechat. Woodland birds include a number of migrant species, like the pied flycatcher, the wood warbler or the common redstart. Mammals found here include otters, hazel dormice and nearly all of the UK's 16 bat species. Three rare species, the barbastelle, and the greater and lesser horseshoe bats are of particular importance. The upper reaches of the rivers, are spawning grounds for Salmon and trout and Palmate newts, frogs and toads breed in the numerous small pools. Two shrimp species can be found on Dartmoor: fairy shrimp that can be found in temporary pools and in underground streams very rare cave shrimp. The world's largest land slug, the Ash black, is also found. Reptiles include common lizards and adders. The farmland in the wet valleys around the edge of the moors is the most important habitat for insects including the marsh fritillary butterfly, southern damselfly, narrow-bordered bee hawkmoth and bog hoverfly. Areas of bracken are home to the high brown fritillary and pearl-bordered fritillary. Insects found in the heathlands include the emperor moth, green hairstreak and the bilberry bumblebee. The old oak woodlands have a distinctive group of insects including the blue ground beetle and Heckford's pygmy moth, a species found nowhere else in the world. The majority of the prehistoric remains on Dartmoor date back to the late Neolithic and early Bronze Age. Indeed, Dartmoor contains the largest concentration of Bronze Age remains in the United Kingdom, which suggests that this was when a larger population moved onto the hills of Dartmoor. The large systems of Bronze Age fields, divided by reaves, cover an area of over 10,000 hectares (39 sq mi) of the lower moors. The climate at the time was warmer than today, and much of today's moorland was covered with trees. The prehistoric settlers began clearing the forest, and established the first farming communities. Fire was the main method of clearing land, creating pasture and swidden types of fire-fallow farmland. Areas less suited for farming tended to be burned for livestock grazing. Over the centuries these Neolithic practices greatly expanded the upland moors, and contributed to the acidification of the soil and the accumulation of peat and bogs. After a few thousand years the mild climate deteriorated leaving these areas uninhabited and consequently relatively undisturbed to the present day. The highly acidic soil has ensured that no organic remains have survived, but the durability of the granite has meant that the remains of buildings, enclosures and monuments have survived well, as have flint tools. A number of remains were "restored" by enthusiastic Victorians and that, in some cases, they have placed their own interpretation on how an area may have looked. Yellowmead Down, a quadruple concentric stone circle and stone rows. There are also an estimated 5,000 hut circles still surviving although many have been raided over the centuries by the builders of the traditional dry stone walls. These are the remnants of Bronze Age houses. The smallest are around 1.8 m (6 ft) in diameter, and the largest may be up to five times this size. Some have L-shaped porches to protect against wind and rain; some particularly good examples are to be found at Grimspound. It is believed that they would have had a conical roof, supported by timbers and covered in turf or thatch. There are also numerous kistvaens, Neolithic stone box-like tombs. The climate became wetter and cooler[clarification needed] over the course of a thousand years from around 1000 BC, resulting in much of high Dartmoor being largely abandoned by its early inhabitants. It was not until the early Mediaeval period that the weather again became warmer, and settlers moved back onto the moors. Like their ancient forebears, they also used the natural granite to build their homes, preferring a style known as the longhouse — some of which are still inhabited today, although they have been clearly adapted over the centuries. Many are now being used as farm buildings, while others were abandoned and fell into ruin. The earliest surviving farms, still in operation today, are known as the Ancient Tenements. Most of these date back to the 14th century and sometimes earlier. Some way into the moor stands the town of Princetown, the site of Dartmoor Prison, which was originally built by Isbell Rowe & Company, Plymouth, for prisoners of war from the Napoleonic Wars and the War of 1812. The prison has an incorrect reputation for being escape-proof, due to both the buildings themselves and its physical location. The Dartmoor landscape is scattered with the marks left by the many generations who have lived and worked there over the centuries – such as the remains of the Dartmoor tin-mining industry, and farmhouses long since abandoned. Indeed, the industrial archaeology of Dartmoor is a subject in its own right. Dartmoor is known for its myths and legends. It is reputedly the haunt of pixies, a headless horseman, a mysterious pack of "spectral hounds", and a large black dog, among others. During the Great Thunderstorm of 1638, the moorland village of Widecombe-in-the-Moor was even said to have been visited by the Devil. Many landmarks have ancient legends and ghost stories associated with them, such as the allegedly haunted Jay's Grave, the ancient burial site of Childe's Tomb, the rock pile called Bowerman's Nose, and the stone crosses that mark former mediaeval routes across the moor. A few stories have emerged in recent decades, such as the "hairy hands", that are said to attack motorists on the B3212 near Two Bridges; and the "Beast of Dartmoor", a supposed big cat. Dartmoor has inspired a number of artists and writers, such as Sir Arthur Conan Doyle in The Hound of the Baskervilles and The Adventure of Silver Blaze, R. D. Blackmore, Eden Phillpotts, Beatrice Chase, Agatha Christie, Rosamunde Pilcher, and the Reverend Sabine Baring-Gould. In Harry Potter and the Goblet of Fire, the fictional 1994 Quidditch World Cup final between Ireland and Bulgaria was hosted on the moor. Over half of Dartmoor National Park (57.3%) is private land; the Forest of Dartmoor being the major part of this, owned by the Duke of Cornwall. The Ministry of Defence owns 14% (see below), 3.8% is owned by water companies (see Dartmoor reservoirs), 3.7% by the National Trust, 1.8% by the Forestry Commission and 1.4% by Dartmoor's national park authority. About 37% of Dartmoor is common land. Dartmoor differs from some other National Parks in England and Wales, in that since the Dartmoor Commons Act 1985 much of it has been designated as 'Access Land', which, although it remains privately owned, has no restrictions on where walkers can roam. In addition to this Access Land, there are about 730 km (450 mi) of public rights of way on Dartmoor, and many kilometres of permitted footpaths and bridleways where the owner allows access. Because of the 1985 Act, Dartmoor was largely unaffected by the Countryside and Rights of Way Act 2000, which established similar rights in other rural parts of the country, but in 2006, this Act opened up much of the remaining restricted land to walkers. There is a tradition of military usage of Dartmoor dating back to the Napoleonic Wars. Today, a large British Army training camp remains at Okehampton — also the site of an airbase during the Second World War. The Ministry of Defence (MoD) uses three areas of the northern moor for manoeuvres and live-firing exercises, totalling 108.71 km2 (41.97 sq mi), or just over 11% of the National Park. Red and white posts mark the boundaries of these military areas (shown on Ordnance Survey 1:25,000 scale maps). Flagpoles on many tors in and around the ranges fly red flags when firing is taking place. At other times, members of the public are allowed access. Blank rounds may also be used, but the MoD does not notify the public of this in advance. Some "challenge" and charitable events take place with assistance of the military on Dartmoor including the long established Ten Tors event and the more recent Dartmoor Beast. Dartmoor's fictional use as an MoD centre for animal testing called Baskerville was referenced in the BBC drama Sherlock episode "The Hounds of Baskerville". The disused Rippon Tor Rifle Range was built to train soldiers during the Second World War, and remained in use until its closure in 1977. Throughout human history, the landscape has been exploited for industrial purposes. In recent years, controversy has surrounded the work of industrial conglomerates Imerys and Sibelco (formerly Watts Blake Bearne), who have used parts of the moor for china clay mining. Licences were granted by the British Government but were recently renounced after sustained public pressure from bodies such as the Dartmoor Preservation Association. The British government has made promises to protect the integrity of the moor; however, the cost of compensating companies for these licences, which may not have been granted in today's political climate, could prove prohibitive. The military use of the moor has been another source of controversy, such as when training was extended in January 2003. The national park authority received 1,700 objections before making the decision. Objectors claimed that Dartmoor should be an area for recreation, and that the training disturbs the peace. Those who objected included the Open Spaces Society and the Dartmoor Preservation Association. During her lifetime, Lady Sayer was another outspoken critic of the damage which she perceived that the army was doing to the moor. Dartmoor has a resident population of about 33,000, which swells considerably during holiday periods with incoming tourists. The largest settlements within the National Park are Ashburton (the largest with a population of about 3,500), Buckfastleigh, Moretonhampstead, Princetown, Yelverton, Horrabridge, South Brent, Christow, and Chagford. For a full list, expand the Settlements of Dartmoor navigational box at the bottom of this page. Lustleigh Cleave – deep cleave on the Sticklepath Fault lined with trees and tors. Staldon Stone Row – longest stone row on Dartmoor and potentially the world. Until the early 19th century Dartmoor was not considered to be a place worth visiting: in the 1540s John Leland wrote in his Itinerary that "Dartmore is muche a wilde Morish and forest Ground", and even by 1789 Richard Gough's opinion was that it is a "dreary mountainous tract". At the turn of the 19th century John Swete was one of the first people to visit Dartmoor for pleasure and his journals and watercolour paintings now provide a valuable historical resource. The oldest leisure pursuit on the moor is hill walking. William Crossing's definitive Guide to Dartmoor was published in 1909, and in 1938 a plaque and letterbox in his memory were placed at Duck's Pool on the southern moor. Parts of the Abbots Way, Two Moors Way and the Templer Way are on Dartmoor. Letterboxing originated on Dartmoor in the 19th century and has become increasingly popular in recent decades. Watertight containers, or 'letterboxes', are hidden throughout the moor, each containing a visitor's book and a rubber stamp. Visitors take an impression of the letterbox's rubber stamp as proof of finding the box and record their visit by stamping their own personal stamp in the letterbox's logbook. A recent related development is geocaching. Geocache clues make use of GPS coordinates, whereas letterboxing clues tend to consist of grid references and compass bearings. Whitewater kayaking and canoeing are popular on the rivers due to the high rainfall and their high quality, though for environmental reasons access is restricted to the winter months. The River Dart is the most prominent meeting place, the section known as the Loop being particularly popular. 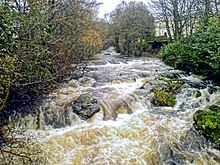 Other white water rivers are the Erme, Tavy, Plym and Meavy. Other activities are rock climbing on the granite tors and outcrops, some of the well-known venues being Haytor, Hound Tor and The Dewerstone; horse riding, which can be undertaken on any of the common land; cycling (but not on open moorland); and angling for wild brown trout, sea trout and salmon—although much of the river fishing on Dartmoor is privately owned, permits are available for some stretches. The park's main visitor centre is located in Princetown and features exhibits about Dartmoor's history, culture and wildlife, as well as changing displays of local art. The visitor centres located in Postbridge and Haytor feature information, maps, guidebooks and items for exploring the area. ^ a b c d e "General Information Factsheet". Dartmoor National Park Authority. Archived from the original on 8 September 2008. Retrieved 12 July 2009. ^ Bradt, Hilary; Booth, Janice (2014). South Devon & Dartmoor. Chalfont St Peter: Bradt. p. 222. ISBN 9781841625522. ^ Sandles, Tim. "The Bogs & Mires of Dartmoor". Legendary Dartmoor. Retrieved 12 July 2009. ^ Crossing, W, Crossing's Guide to Dartmoor 1912 edition, published by Western Morning News Co. Ltd.
^ Brunsden, Denys; Gerrard, John (1970). "The Physical Environment of Dartmoor". In Crispin Gill (ed.). Dartmoor. A New Study. Newton Abbot: David and Charles. pp. 40–42. ISBN 0-7153-5041-2. ^ Sandles, Tim. "Dartmoor's Notorious Fox Tor Mires". Legendary Dartmoor. Retrieved 7 July 2009. ^ a b "Dartmoor IPA". Plantlife. Retrieved 3 June 2018. ^ "Dartmoor - Special Area of Conservation". Joint Nature Conservation Committee. Retrieved 3 June 2018. ^ "Birds". Dartmoor National Park. Retrieved 3 June 2018. ^ "Mammals". Dartmoor National Park. Retrieved 3 June 2018. ^ "Other animals". Dartmoor National Park. Retrieved 3 June 2018. ^ "Insects". Dartmoor National Park. Retrieved 3 June 2018. ^ "Prehistoric Dartmoor". Dartmoor National Park Authority. Archived from the original on 1 December 2009. Retrieved 2 September 2009. ^ Sandles, Tim. "The Hairy Hands". Legendary Dartmoor. Retrieved 7 August 2010. ^ Sandles, Tim. "The Legendary Beast of Dartmoor". Legendary Dartmoor. Archived from the original on 23 August 2010. Retrieved 7 August 2010. ^ "Dartmoor Commons" (PDF). Dartmoor National Park Authority. Archived from the original (PDF) on 27 February 2008. Retrieved 19 March 2008. ^ "Public Rights of Way". Dartmoor National Park Authority. Archived from the original on 11 September 2009. Retrieved 14 July 2009. ^ Hedges, Mike (2004). 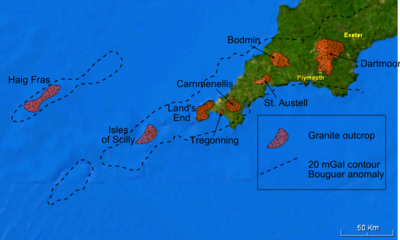 "The 7th Dartmoor Society Debate: How Important is China Clay to Dartmoor?". The Dartmoor Society. Retrieved 8 June 2017. ^ "ViaMichelin Travel. Panorama - Great Britain: The Michelin Green Guide". Viamichelin.com. 3 April 2008. Archived from the original on 6 May 2013. Retrieved 18 April 2010. ^ "Walking For All". Dartmoor National Park Authority. Archived from the original on 18 April 2009. Retrieved 12 July 2009. ^ "South West England". UK Rivers Guidebook. Retrieved 18 April 2010. ^ "Canoeing". Dartmoor National Park Authority. Archived from the original on 23 June 2009. Retrieved 12 July 2009. ^ "Climbing". Dartmoor National Park Authority. Archived from the original on 14 July 2009. Retrieved 10 July 2009. ^ "Horse Riding". Dartmoor National Park Authority. Archived from the original on 17 July 2009. Retrieved 12 July 2009. ^ "Cycling on road and off road". Dartmoor National Park Authority. Archived from the original on 30 April 2009. Retrieved 12 July 2009. ^ "Other Activities". Dartmoor National Park Authority. Archived from the original on 17 July 2009. Retrieved 10 July 2009. Crossing, William Crossing's Guide to Dartmoor, the 1912 edition reprinted with new introd. by Brian Le Messurier. Dawlish: David & Charles, 1965. Durrance, E. M.; Laming, D. J. (1982). The Geology of Devon. University of Exeter. ISBN 0-85989-247-6. Milton, Patricia (2006). The Discovery of Dartmoor, a Wild and Wondrous Region. Chichester: Phillimore. ISBN 1-86077-401-6. Webb, Bruce (2006). "The Environmental Setting of Human Occupation". In Roger Kain (ed.). England's Landscape: The South West. London: Collins. pp. 30–33. ISBN 0-00-715572-7. 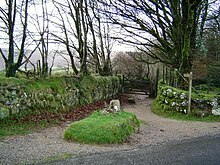 Wikivoyage has a travel guide for Dartmoor. Wikimedia Commons has media related to Dartmoor.